Is it possible to make a living from your art? I recently got an email from someone asking if it’s worth it to put in the work on social media to grow a large following if I still make comments about being a somewhat starving artist. The answer is different for everyone. 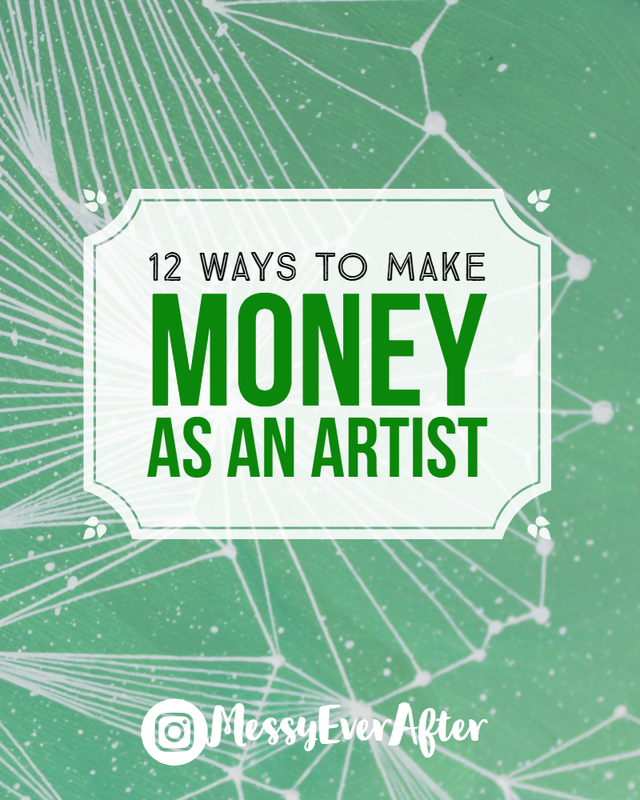 If you want money right this very moment, being an artist is probably the last thing you want to do. If you want to pursue your passion and have the patience to put in the work for a while without receiving an immediate reward, then yes it’s totally worth it. Making a living isn’t going to happen over night. It’s a hustle, and income will be inconsistent for a while. Growing an art business takes time and a lot of creative thinking. At times you will have to create your own opportunities and step out of your comfort zone in order to see your numbers rise. Since you’re in it for the long haul, it’s important to remember to acknowledge any progress you make to keep yourself from burning out. First, there are two main categories of income. Active Income: Income that comes directly from actions you perform. Ex. commissioned work, creating original pieces, teaching classes etc.. Passive Income: Income that you earn without additional work put in. Ex. licensed work royalties, online class subscriptions, affiliate links, advertising revenue etc.. If you want to create more consistent income or make more money without putting in more effort, you’ll want to explore passive revenue streams. In the beginning you are going to be very active to get things up and running. This is where the bulk of my income comes from at the moment. Once you have a social following, you can start to drive that traffic to your store front. There isn’t a magic formula that ‘x’ amount of followers gives you ‘x’ amount of sales, but the more eyes on your work, the higher the chances of making a sale. You can also look at paid promotions and advertisements, but I’m not an expert on that (yet). This is my least favorite way to earn money (Hi, I’m an introvert!). Booking craft fairs, art fairs, or other in person sales events can give you a sizable boost in income. They usually take a lot of time to prepare for. You spend 8+ hours talking to people, and cross your fingers that you’ll at least cover your costs. Successful large shows can bring you thousands in sales within a weekend. Unsuccessful craft events can leave you in the hole, grumpy, and defeated. Research and attend events before signing up for them. Talk to the artists that participate and see how their experience has been with that show. Make sure the event is well known, adequately advertised, and has a juried process for acceptance. Nothing worse than setting up your fine art next to a multi-level marketing vendor. Somebody might love what you do, but want a different color scheme or size for their home. Accepting commissions is a good way to diversify your income and get to know your customers. Let your following know you accept custom orders on your website, individual posts, or social media bio. Having a solo show at a fancy art gallery is a dream a lot of us have. You’re able to hang the work, mingle with art lovers at an opening reception, and hopefully sell pieces at a higher price. Even though galleries will take a large chunk of the sale to keep their business running, it’s still a great opportunity. It’s hard to immediately get a solo show, but you can work your way into galleries by participating in group shows and building your own following in the surrounding community. Teaching others is a great way to earn extra income. Most of the art instructors I had in school were full time creators. It’s how a lot of artists keep the lights on while building their careers. Look into creating a community education course in your town for your favorite art techniques. Consider hosting a painting party or becoming a teacher for the Paint Nite type companies out there. If you have a Masters in art you can look into teaching at a university or community college. Explore online class formation on platforms like Skillshare. If you become an expert in social media, bookkeeping, video editing, or any of the non-art skills needed in the art world then you could definitely explore this option. You know those blogs I write to share my supplies and tips? Yeah, I earn commissions if anyone makes a purchase through the links I include in my posts. Since a lot of your social following will probably be other artists that want to do what you do, you can take advantage of their willingness to learn and earn passive income. You know those nameless pieces of art in hotels, lawyer’s offices, and the home decor section of Target? Those were all created by an actual artist. It may be mass produced and sold by a corporation, but there is an artist out there collecting 5-7% in royalties from each sale. If you get a collection of works licensed with a large enough company, you can create a nice passive income stream. These sites are an option for getting your work out there, but you’re the one that has to maintain the product listings and you still only get a small percentage of the sale. As your social following grows, you will have more power to pair up with big brands to promote their products. I started reaching out to large companies once I hit 20,000 followers on Instagram to see if they would be willing to provide free supplies in exchange for social exposure. Free supplies might not be income, but it’s a great perk. The best part is as your social influence grows even more big brands will actually pay you to promote their products through targeted campaigns. There are multiple social influencer platforms that you can look into to make yourself known to brands seeking authentic promoters. Do you like live streaming your process? Well there is a whole market for that. Twitch was originally for gamers to stream their game play, but there is now a creative section for artists to stream what they do in the studio. There are artists who make a complete living through their streaming channel by allowing people to subscribe and overlapping it with Patreon pledges. Check out how Sezzadactyl does it. There are definitely a crap ton of other ways you can earn money as an artist, but these are the options I have personally explored. I currently earn income from online sales, commissioned art, affiliate programs, consulting work, and Patreon on a monthly basis. Since I have at least five streams of income per month now, I don’t have to panic when the sales in my store slow down. The biggest takeaway I want you to have from this post is that you must diversify your streams of income. Do not just depend on one area for money. Yes, it would be great to be able to just sell original works of art and pay the bills, but you leave yourself vulnerable when the market changes. I work all the time. Whether I’m doing social media, bookkeeping, marketing, updating inventory, or actually making art—it feels like my art business is my life. I love it, but it’s not something that I would recommend for people who just ‘like’ making art or need money to pay the electric bill by next week. Again, building strong and consistent streams of income from your art will take time. After quitting my full time job in 2016, it took me a year to finally see forward momentum. I hardly made any money during that year. In 2018, I’ve seen loads of progress, but I’m still working on consistency. I’ve made anywhere from $269 in a month to $8,800 in a month. Start with one income stream and go from there. If you have any questions or comments please leave them below while commenting is open or reach out to me directly through email or Instagram. Or, if you would like one on one help to grow your following or find your direction as an artist, check out my consulting services. P.S. If you enjoy my blogs and gain any inspiration from the content I put out there, please consider becoming a Patron of Messy Ever After on Patreon. Pledging just $1 a month enables me to keep doing what I do like writing these blogs. Plus, you get extra little perks like phone wallpapers and discounts to my store!